In 1756, the monarchy of Prussia, ruled at the time by Frederick II (later called 'the Great'), faced a perilous situation. An alliance with Great Britain had resulted in Prussia's strategic encirclement and a war with Austria, Russia, and France (and some of their lesser allies) simultaneously. 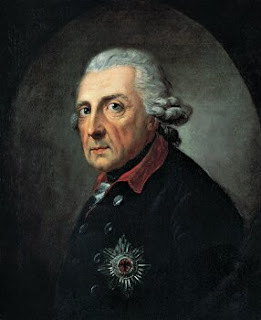 Despite the odds, and numerous setbacks throughout the war, Frederick and his forces were able to leverage inherent advantages (interior lines of communication, Frederick's leadership, and the excellent Prussian army) and good fortune (namely, the death of Tsarina Elizabeth and the withdrawal of Russia, temporarily, from the war) allowed Prussia to defeat or make peace with all of its (1) enemies and end the war in an improved political and strategic position in Europe. On the morning of 12 December 1941, the citizens of the expanded German state (formed around Prussia after the triumphs of Bismark in the 1860s-70s) woke up to find themselves in a similar state of encirclement and war. Since 3 September 1939, Germany had been at war with Great Britain and France, the former continued to fight even after the subdual of the latter. Since then, on account of the ideology and ambitions of its leadership, Germany had expanded the war, first by invading its erstwhile trading partner and ally, the Soviet Union on 22 June 1941, and second, by declaring war on the United States of America only the day before. A political cartoon by Dr Seuss (yes, that Dr Seuss). On the surface, while Germany's situation in 1941 seemed similar to Prussia's situation in 1756, things did not seem so bad: Germany had Italy and Japan as allies, and the latter in particular had scored a great success against the United States and the other European colonial powers. Whereas Prussia's enemies were close in, Germany was fighting its foes at some remove from its borders: in North Africa, in the North Atlantic, and, after a breathtakingly successful campaign, at the gates of Moscow. In addition, almost all of Europe was either allied to or subjugated by Germany or engaged in a more-or-less deferent neutrality. 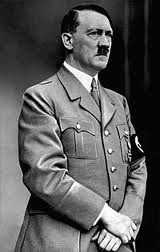 However, unlike Frederick's Prussia, Hitler's Germany was unable to parlay its apparent advantages into victory (or at least a settled peace). Within a year, Germany and its allies were already defeated: only German and Japanese obstinance in the face of this fact kept them in the war until the bitter end. Not quite Frederick the Great, as it turned out. I suspect almost everyone who has a reasonable knowledge of the war would agree that the coalition centred around Germany, colloquially known as the Axis Powers, were in hindsight very unlikely to win the kind of war they found themselves embroiled in as of December 1941. I would go further than this and suggest that the Axis powers had engaged in unwinnable wars as far back as the start of the Second World War in Asia on 7 July 1937 or in Europe on 1 September 1939, although of course this would scarcely be obvious to contemporaries. I do not think this thesis is too far off from the view of a plurality of professional historians or of well-versed amateurs. As I hope to show, even given the contingencies of history, there are on my view essentially no circumstances under which the Axis could have won the Second World War. Given Germany was the strongest of the Axis powers, both militarily and politically, I will focus the posts to follow in this series on Germany. Notes on Italy and other European members of their coalition will be found in the posts on Germany; while Japan will have a single post in which its circumstances will be reviewed. Due to the limitations of time (namely, my lack of it given full-time employment, other hobbies, a marriage and most importantly a baby), I expect that posts in this series will occur between one and three months. Beached Sealion: In this post, I will argue that Germany, even had it focused its war effort more fully against Great Britain, was simply not in a position to defeat Britain in 1940-1941. Bear Mauling: Despite the wild success of the 1941 campaign, Germany failed to bring the USSR to its knees. In this post, I will argue that Germany lacked the means to defeat the USSR in 1941-1942. Jolly Green Giant: Once the United States entered the war, Germany's defeat was ensured. Here we will examine how German material, human resources were dwarfed by the American colossus, and how American aid allowed the other Allies to pursue victory much more quickly than they might have managed on their own. The French Correction: The only major Allied power that the Axis coalition was able to defeat was France. In this post we shall see how this was possible. None So Blind: With the entry of the United States into the war, the Allies could be reasonably certain of victory. Assuming the Germans were as aware of their deficiencies by mid-1942, why not admit defeat and surrender? Setting Sun: From 7 July 1937, Japan entangled itself in a series of unwinnable wars: first against China, then expanding to fight the European colonial powers and the United States on 7 December 1941. 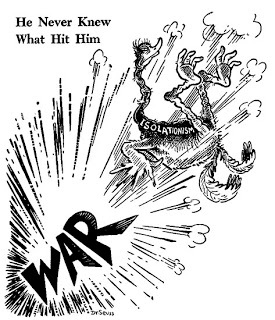 This post focuses on Japan's war, and argues that Japanese defeat was inevitable. The series will end with a post of concluding remarks. Due to the time constraints imposed by employment, other hobbies, and most especially a baby, I expect to publish a post at best every 2 months or so. (1) It has often been customary for historians and committed nationalists alike to refer to nation-states as gendered (male or female). I will not do so, preferring neutral gender. I just read your comment over at Respectful Insolence ("ritually impure") and wanted to say that gave me a good laugh. The National Post's War on Science: Boogeymen!